The 40-ray sun on the flag of Kyrgyzstan is a reference to those same forty tribes and the graphical element in the sun's center depicts the wooden crown, called tunduk, of a yurt—a portable dwelling traditionally used by nomads in the steppes of Central Asia. In terms of naming conventions, the country's official name is "Kyrgyz Republic" whenever it is used in some international arenas and foreign relations. However, in the English-speaking world, the spelling Kyrgyzstan is commonly used while its former name Kirghizia is rarely used as such. In the twelfth century the Kyrgyz dominion had shrunk to the Altay Range and Sayan Mountains as a result of the Mongol expansion. With the rise of the Mongol Empire in the thirteenth century, the Kyrgyz migrated south. The Kyrgyz peacefully became a part of the Mongol Empire in 1207. 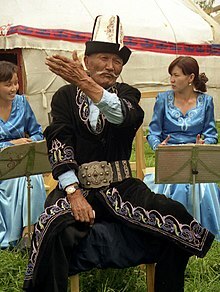 The descent of the Kyrgyz from the indigenous Siberian population, on the other hand, is confirmed by recent genetic studies. Because of the processes of migration, conquest, intermarriage, and assimilation, many of the Kyrgyz peoples who now inhabit Central and Southwest Asia are of mixed origins, often stemming from fragments of many different tribes, though they now speak closely related languages. 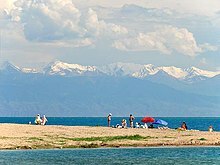 In the late nineteenth century, the eastern part of what is today Kyrgyzstan, mainly the Issyk-Kul Region, was ceded to the Russian Empire by Qing China through the Treaty of Tarbagatai. The territory, then known in Russian as "Kirghizia", was formally incorporated into the Empire in 1876. The Russian takeover was met with numerous revolts, and many of the Kyrgyz opted to relocate to the Pamir Mountains and Afghanistan. 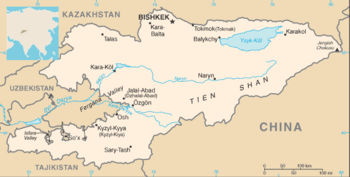 Soviet power was initially established in the region in 1919, and the Kara-Kyrgyz Autonomous Oblast was created within the Russian SFSR (the phrase Kara-Kirghiz was used until the mid-1920s by the Russians to distinguish them from the Kazakhs, who were also referred to as Kirghiz). On 5 December 1936, the Kirghiz Soviet Socialist Republic was established as a constituent Union Republic of the Soviet Union. During the 1920s, Kyrgyzstan developed considerably in cultural, educational and social life. Literacy was greatly improved, and a standard literary language was introduced by imposing Russian on the populace. Economic and social development also was notable. Many aspects of the Kyrgyz national culture were retained despite the suppression of nationalist activity under Joseph Stalin. By then, the Kyrgyzstan Democratic Movement (KDM) had developed into a significant political force with support in Parliament. On 15 December 1990, the Supreme Soviet voted to change the republic's name to the Republic of Kyrgyzstan. The following January, Akayev introduced new government structures and appointed a new cabinet composed mainly of younger, reform-oriented politicians. In February 1991, the name of the capital, Frunze, was changed back to its pre-revolutionary name of Bishkek. Political stability appeared to be elusive, however, as various groups and factions allegedly linked to organized crime jockeyed for power. Three of the 75 members of Parliament elected in March 2005 were assassinated, and another member was assassinated on 10 May 2006 shortly after winning his murdered brother's seat in a by-election. All four are reputed to have been directly involved in major illegal business ventures. [according to whom?] On 6 April 2010, civil unrest broke out in the town of Talas after a demonstration against government corruption and increased living expenses. The protests became violent, spreading to Bishkek by the following day. Protesters attacked President Bakiyev's offices, as well as state-run radio and television stations. There were conflicting reports that Interior Minister Moldomusa Kongatiyev had been beaten. On 7 April 2010, President Bakiyev imposed a state of emergency. Police and special services arrested many opposition leaders. In response, protesters took control of the internal security headquarters (former KGB headquarters) and a state television channel in the capital, Bishkek. Reports by Kyrgyzstan government officials indicated that at least 75 people were killed and 458 hospitalized in bloody clashes with police in the capital. Reports say that at least 80 people died as a result of clashes with police. A transition government, led by former foreign minister Roza Otunbayeva, by 8 April 2010 had taken control of state media and government facilities in the capital, but Bakiyev had not resigned from office. President Roza Otunbayeva also said in August 2010 that an international commission would also be formed to investigate the clashes. The international commission conducted an extensive investigation and prepared a report – The Independent international commission of inquiry into the events in southern Kyrgyzstan in June 2010 (KIC) . It stated that "The Provisional Government, which had assumed power two months before the events, either failed to recognize or underestimated the deterioration in inter-ethnic relations in southern Kyrgyzstan". The KIC concluded that the "Provisional Government had the responsibility to ensure that the security forces were adequately trained and appropriately equipped to deal with situations of civil unrest" but unable to take necessary measures. Other reports contain a different account. A report, released in January 2011, concluded that the events in southern Kyrgyzstan constituted a “planned, large-scale provocation, oriented towards the splitting of Kyrgyzstan and disrupting the unity of its people.” Responsibility for this provocation was seen as lying with “nationalistically-minded leaders of the Uzbek community”. In the aftermath of the turmoil, on 5 August 2010, Kyrgyz forces arrested party leader Urmat Baryktabasov on suspicion of plotting an overthrow of the government, after troops allegedly fired blank rounds at a crowd trying to join mass demonstrations near the Parliament in the capital Bishkek. Acting President Roza Otunbayeva said security forces seized firearms and grenades from him and 26 supporters. Sooronbay Jeenbekov, President, in office since 2017. Mukhammedkalyi Abylgaziev, Prime Minister, in office since 2018. The amendments to the constitution approved by the referendum resulted in stronger control by the president and weakened the parliament and the Constitutional Court. Parliamentary elections for a new, 75-seat unicameral legislature were held on 27 February and 13 March 2005, but were widely viewed as corrupt. The subsequent protests led to a bloodless coup on 24 March 2005, after which Akayev fled the country with his family and was replaced by acting president Kurmanbek Bakiyev (see: Tulip Revolution). On 10 July 2005, acting president Bakiyev won the presidential election in a landslide, with 88.9% of the vote, and was inaugurated on 14 August. However, initial public support for the new administration substantially declined in subsequent months as a result of its apparent inability to solve the corruption problems that had plagued the country since its independence from the Soviet Union, along with the murders of several members of parliament. 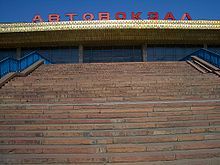 Large-scale protests against president Bakiyev took place in Bishkek in April and November 2006, with opposition leaders accusing the president of failing to live up to his election promises to reform the country's constitution and transfer many of his presidential powers to parliament. Kyrgyzstan is also a member of the Organization for Security and Cooperation in Europe (OSCE), a league of 56 participating states committed to peace, transparency, and the protection of human rights in Eurasia. As an OSCE participating State, Kyrgyzstan's international commitments are subject to monitoring under the mandate of the U.S. Helsinki Commission. In December 2008, the state-owned broadcast UTRK announced that it would require prior submission of Radio Free Europe/Radio Liberty programmes, which UTRK are required to retransmit according to a 2005 agreement. UTRK had stopped retransmitting RFE/RL programming in October 2008, a week after it failed to broadcast an RFE/RL programme called 'Inconvenient Questions' which covered the October elections, claiming to have lost the missing material. President Bakiyev had criticised this programme in September 2008, while UTRK told RFE/RL that its programming was too negative. Reporters Without Borders, which ranks Kyrgyzstan 111th out of 173 countries on its Press Freedom Index, strongly criticised the decision. On 3 February 2009, President Kurmanbek Bakiyev announced the imminent closure of the Manas Air Base, the only US military base remaining in Central Asia. The closure was approved by Parliament on 19 February 2009 by a vote of 78–1 for the government-backed bill. However, after much behind-the-scenes negotiation between Kyrgyz, Russian and American diplomats, the decision was reversed in June 2009. The Americans were allowed to remain under a new contract, whereby rent would increase from $17.4 million to $60 million annually. Kyrgyzstan is among the fifty countries in the world with the highest perceived level of corruption: the 2016 Corruption Perception Index for Kyrgyzstan is 28 on a scale of 0 (most corrupt) to 100 (least corrupt). In 2010 another revolution erupted in the country (see: April uprising). President Kurmanbek Bakiyev together with his relatives—e.g. son Maksim and brother Janish—were forced to flee to Kazakhstan and then sought asylum in Belarus. Roza Otunbayeva, who was appointed interim president, announced that she did not intend to run for the Presidential elections in 2011. The election was held in November and won by the then-Prime Minister Almazbek Atambayev, leader of the Social Democratic Party, and Atambayev was sworn in as president on 1 December 2011. Omurbek Babanov was appointed prime minister on the same day and was confirmed on 23 December 2011. Kyrgyzstani activist and journalist Azimzhan Askarov was sentenced to life in prison in 2010. On 24 January 2017, a Kyrgyz court has reinstated a sentence of life imprisonment for Askarov. The armed forces of Kyrgyzstan were formed after the collapse of the Soviet Union and consist of the Land Forces, Air Forces, internal troops, National Guard, and the border guard. The military works with the US Armed Forces, which leased a facility named the Transit Center at Manas at Manas International Airport near Bishkek until June 2014. In recent years, the armed forces have begun developing better relations with Russia including signing modernization deals worth $1.1bn and partaking in more exercises with Russian troops. The Agency of National Security works with the military and serves similar purposes to its Soviet predecessor, the KGB. It oversees an elite counterterrorism special forces unit known as "Alfa", the same name used by other former Soviet countries, including Russia and Uzbekistan. The police are commanded by the Ministry of the Interior Affairs, along with the border guard. 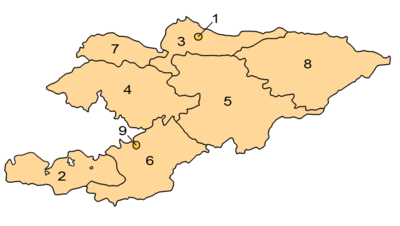 Kyrgyzstan has significant deposits of metals including gold and rare-earth metals. 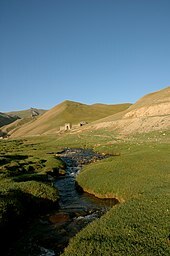 Due to the country's predominantly mountainous terrain, less than 8% of the land is cultivated, and this is concentrated in the northern lowlands and the fringes of the Fergana Valley. Bishkek in the north is the capital and largest city, with 937,400 inhabitants (as of 2015[update]). 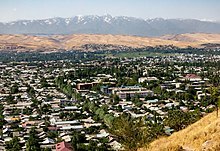 The second city is the ancient town of Osh, located in the Fergana Valley near the border with Uzbekistan. The principal river is the Kara Darya, which flows west through the Fergana Valley into Uzbekistan. Across the border in Uzbekistan it meets another major Kyrgyz river, the Naryn. There are also two enclaves belonging to Tajikistan: Vorukh (exclave area between 95–130 km2 (37–50 sq mi), population estimated between 23,000 and 29,000, 95% Tajiks and 5% Kyrgyz, distributed among 17 villages), located 45 kilometres (28 mi) south of Isfara on the right bank of the Karafshin river, and a small settlement near the Kyrgyz railway station of Kairagach. Among the countries in Eastern Europe and Central Asia, Kyrgyzstan is the third most vulnerable to the effects of climate change, such as changes in weather patterns that could lead to prolonged periods of precipitation and drought. Their average temperature has increased from 4.8 °C to 6 °C so far within the last 20 years. By 2060, there is an expectation of a 2 °C increase in average mean temperature, as well as a 4–5 °C increase by 2100. Climate change will negatively affect climate-sensitive sectors such as agriculture, energy, and forestry. emissions at the time. In 2012, Kyrgyzstan emitted 0.03 percent of the global greenhouse gas emissions. The US Energy Information Administration released a data chart ranking countries based on carbon dioxide emissions from energy consumption. In 1992, Kyrgyzstan ranked 82. The most recent data chart, released for 2010, places Kyrgyzstan at rank 129. By 2030, Kyrgyzstan plans to reduce greenhouse gas emissions from their usual emission levels by between 11.49 percent and 13.75 percent, or by between 29 percent and 31 percent if international support is involved. By 2050, Kyrgyzstan plans to reduce greenhouse gas emissions from their usual emission levels by between 12.67 percent and 15.69 percent, or by between 35 percent and 46.75 percent if international support is involved. Making up over 40 percent of the country's labor force, the agricultural sector is one of the largest economic sectors for Kyrgyzstan. The majority of the vegetable production is seasonal. Weather patterns are expected to change during seasonal periods. The summer months are expected to show a significant reduction in precipitation, whereas the winter months are expected to have the largest increase in precipitation. Changes to these precipitation patterns will affect what crops will be suitable for production during those periods. Grazing lands and pastures for livestock production will be affected as the availability of precipitation will determine growth and the ability to regenerate. Glaciers and snow melt are important for filling up rivers that Kyrgyzstan relies on. Hydro power is the country's main source of energy, making up about 90 percent of electricity generation. Climate change will cause further complications as hydroelectric generation will not be able to meet peak demand during the winter season. Hydro power output is expected to decrease as climate change projections suggest that water flow will be reduced from the year 2030 and onward, which will eventually cause energy supply problems. In regards to energy infrastructure, higher temperatures and extreme weather events may cause significant damages. Shifts in ecological zones may cause higher states of plant vulnerability and the inability for certain plant species to adapt to new climate conditions, thus creating the possibility of losing forest resources, such as firewood, fruits, and medicinal herbs. The walnut forest in Arslanbob allows Kyrgyzstan to be one of the world's largest walnut exporters, but farmers predict that walnut yields may fall up to 70 percent in 2018 due to climate change and soil erosion. As Kyrgyzstan is situated in a mountainous region, the country is vulnerable to climate-related risks, such as floods, landslides, avalanches, snowstorms, etc. Climate change is expected to worsen the disasters in action and in damages. There has been an increased amount of floods and mudslides as, compared to the volume of glaciers in 1960, the volume has reduced by 18 percent in 2000. In 2012, from 23 April to the 29th, destructive flash floods affected more than 9,400 people in the Osh, Jalalabad, and Batken regions. Kyrgyzstan's geography includes 80 percent of the country being found within the Tian Shan mountain chain, and 4 percent of that is area that is permanently under ice and snow. More than 8,500 glaciers are in proximal distance to Kyrgyzstan and research has shown that glacier mass has reduced sharply within the past 50 years. An indicator of atmospheric warming is the amount of glacier mass lost. Glacier monitoring was performed on the majority of the glaciers of the Tian Shan mountain chain by the former Union of Soviet Socialist Republics (USSR), however operations have largely ceased to exist after its collapse in the early 1990s. As of recently, there has been a re-establishment of glacier monitoring sites in Kyrgyzstan with the Abramov glacier, Golubin glacier, Batysh Sook glacier, and Glacier No. 345. Observations and research over the last five decades show that, overall, the Central Asian glaciers portray more mass loss than mass gain. From 2000 to 2100, glacial areas are expected to be reduced between 64 and 95 percent. In 2013 and 2014, the energy sector received the largest amount of climate-related development finance. Rehabilitation projects include: the At Bashy Hydro Power Plant supported by Switzerland and the Toktogul Hydro Power Plant (Phase 2) supported by the Asian Development Bank (ADB) and Eurasian Development Bank. Infrastructure development, such as with dam safety. Supported by the Japan International Cooperation Agency (JICA), is the "International Main Roads Improvement Project," which seeks to apply disaster risk reduction measures, such as tunnel construction, and precautions against falling rocks and landslides. Kyrgyzstan is ranked 78th among countries for economic freedom. The National Bank of the Kyrgyz Republic serves as the Central bank of Kyrgyzstan. Kyrgyzstan was the ninth poorest country in the former Soviet Union, and is today the second poorest country in Central Asia after Tajikistan. 31.7% of the country's population lives below the poverty line. Despite the backing of major Western lenders, including the International Monetary Fund (IMF), the World Bank and the Asian Development Bank, Kyrgyzstan has had economic difficulties following independence. Initially, these were a result of the breakup of the Soviet trade bloc and resulting loss of markets, which impeded the republic's transition to a demand economy. In regards to telecommunication infrastructure, Kyrgyz Republic ranks last in Central Asia in the World Economic Forum's Network Readiness Index (NRI) – an indicator for determining the development level of a country's information and communication technologies. Kyrgyz Republic ranked number 118 overall in the 2014 NRI ranking, unchanged from 2013 (see Networked Readiness Index). The nation's largest ethnic group are the Kyrgyz, a Turkic people, who comprise 73.2% of the population. Other ethnic groups include Russians (5.8%) concentrated in the north and Uzbeks (14.6%) living in the south. Small but noticeable minorities include Dungans (1.1%), Uyghurs (1.1%), Tajiks (1.1%), Kazakhs (0.7%), and Ukrainians (0.5%) and other smaller ethnic minorities (1.7%). The country has over 80 ethnic groups. Kyrgyzstan has undergone a pronounced change in its ethnic composition since independence. The percentage of ethnic Kyrgyz has increased from around 50% in 1979 to over 70% in 2013, while the percentage of ethnic groups, such as Russians, Ukrainians, Germans and Tatars dropped from 35% to about 7%. Since 1991, a large number of Germans, who in 1989 numbered 101,000 persons, have emigrated to Germany. Kyrgyzstan is one of two former Soviet republics in Central Asia to have Russian as an official language, Kazakhstan being the other. The Kyrgyz language was adopted as the official language in 1991. 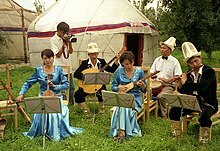 After pressure from the Russian minority in the country, Kyrgyzstan adopted Russian as an official language as well in 1997, to become an officially bilingual country. Islam is the dominant religion of Kyrgyzstan: 80% of the population is NDM (Non-denominational Muslim)[unreliable source?] while 17% follow Russian Orthodoxy and 3% other religions. 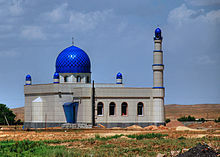 A 2009 Pew Research Center report indicates a higher percentage of Muslims, with 86.3% of Kyrgyzstan's population adhering to Islam. The majority of Muslims are non-denominational Muslims at 64% while roughly 23% are Sunni, adhering to the Hanafi school of thought. There are a few Ahmadiyya Muslims, though unrecognised by the country. There have been several reported police raids against peaceful minority religious meetings, as well as reports of officials planting false evidence, but also some court decisions in favour of religious minorities. Two additional Muslim holidays Orozo Ayt and Qurman (or Qurban) Ayt are defined by lunar calendar. Skiing is still in its infancy as a tourism industry. The ski base of Toguz Bulak is 45 km (28 mi) from Bishkek, on the way to Issyk Ata valley. In the Karakol Valley National Park, outside Karakol. Wrestling is also very popular. In the 2008 Summer Olympic Games, two athletes from Kyrgyzstan won medals in Greco-Roman wrestling: Kanatbek Begaliev (silver) and Ruslan Tyumenbayev (bronze). Ice hockey was not as popular in Kyrgyzstan until the first Ice Hockey Championship was organized in 2009. In 2011, the Kyrgyzstan men's national ice hockey team won 2011 Asian Winter Games Premier Division dominating in all six games with six wins. It was the first major international event that Kyrgyzstan's ice hockey team took part in. The Kyrgyzstan men's ice hockey team joined the IIHF in July 2011. The headquarters of the Kyrgyz Academy of Sciences is located in Bishkek, where several research institutes are located. Kyrgyz researchers are developing useful technologies based on natural products, such as heavy metal remediation for purifying waste water. In September 2016, the University of Central Asia was launched in Naryn, Kyrgyzstan. Transport in Kyrgyzstan is severely constrained by the country's alpine topography. Roads have to snake up steep valleys, cross passes of 3,000 metres (9,800 ft) altitude and more, and are subject to frequent mudslides and snow avalanches. Winter travel is close to impossible in many of the more remote and high-altitude regions. Manas International Airport near Bishkek is the main international airport, with services to Moscow, Tashkent, Almaty, Urumqi, Istanbul, Baku, and Dubai. ^ "Constitution of the Kyrgyz Republic" (PDF). www.refworld.org. Constitution of Kyrgyzstan. ^ a b "Национальный состав населения (оценка на начало года, человек)". stat.kg. ^ a b c 5.01.00.03 Национальный состав населения. [5.01.00.03 Total population by nationality] (XLS). Bureau of Statistics of Kyrgyzstan (in Russian, Kyrgyz, and English). 2018. 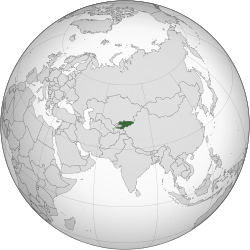 ^ Kyrgyzstan in the CIA World Factbook. ^ a b c d "Report for Selected Countries and Subjects". World Economic Outlook Database. International Monetary Fund. ^ Or /ˌkɪərɡɪˈstɑːn/ KEER-gih-STAHN, or with the stress on the first syllable. See J. C. Wells, Longman Pronunciation Dictionary, 3rd ed. (Harlow, England: Pearson Education Ltd., 2008). ^ a b "Vladimir Putin to meet with Azerbaijani delegation". News.Az. 22 February 2018. ^ "Canada – Kyrgyz Republic Relations". Canadainternational.gc.ca. 5 July 2018. Retrieved 20 September 2018. ^ "The World Bank in the Kyrgyz Republic". Worldbank.org. 26 October 2016. Retrieved 20 September 2018. ^ King, David C (2005). Kyrgyzstan. Marshall Cavendish. p. 144. ISBN 978-0-7614-2013-2. ^ Wells, R. S.; Yuldasheva, N.; Ruzibakiev, R.; Underhill, P. A.; Evseeva, I.; Blue-Smith, J.; Jin, L.; Su, B.; Pitchappan, R.; Shanmugalakshmi, S.; Balakrishnan, K.; Read, M.; Pearson, N. M.; Zerjal, T.; Webster, M. T.; Zholoshvili, I.; Jamarjashvili, E.; Gambarov, S.; Nikbin, B.; Dostiev, A.; Aknazarov, O.; Zalloua, P.; Tsoy, I.; Kitaev, M.; Mirrakhimov, M.; Chariev, A.; Bodmer, W. F. (2001). "The Eurasian Heartland: A continental perspective on Y-chromosome diversity". Proceedings of the National Academy of Sciences. 98 (18): 10244–10249. Bibcode:2001PNAS...9810244W. doi:10.1073/pnas.171305098. PMC 56946. PMID 11526236. ^ Zerjal, T.; Wells, R. S.; Yuldasheva, N.; Ruzibakiev, R.; Tyler-Smith, C. (2002). "A Genetic Landscape Reshaped by Recent Events: Y-Chromosomal Insights into Central Asia". The American Journal of Human Genetics. 71 (3): 466–82. doi:10.1086/342096. PMC 419996. PMID 12145751. ^ "Map of Chinese Empire (1835)". 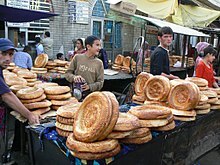 ^ "KYRGYZSTAN: Economic disparities driving inter-ethnic conflict". IRIN Asia. 15 February 2006. ^ "Ethnic Uzbeks in Kyrgyzstan Voice Complaints Over Discrimination, Corruption Archived 14 June 2010 at the Wayback Machine". EurasiaNet.org. 24 January 2006. ^ Leonard, Peter (7 April 2010). "Kyrgyz Opposition Controls Government Building". The Associated Press via ABC News. Archived from the original on 11 April 2010. ^ "2016 official table". 25 January 2017. Retrieved 29 January 2017. ^ Kramer, Andrew E. (1 July 2010). "Uzbeks Accused of Inciting Violence in Kyrgyzstan". The New York Times. Retrieved 16 April 2011. ^ "Human rights groups condemn Kyrgyzstan activist jailing". BBC News. 16 September 2010. ^ "Kyrgyz court confirms life sentence for journalist". Fox News. 24 January 2017. ^ President; Parliament; Government; Politics; Economy; Society; Analytics; Regions; Culture. "Kyrgyzstan ranks third most vulnerable to climate change impacts in Central Asia". Информационное Агентство Кабар. Retrieved 14 December 2018. ^ "Kyrgyzstan is one of the most vulnerable countries to climate change in Central Asia". www.unicef.org. Retrieved 14 December 2018. ^ a b c d e f g h i j k l m n o p q "Kyrgyz Republic: Overview of Climate Change Activities" (PDF). October 2013 – via World Bank Group. ^ a b c "Financing Climate Action in Kyrgyzstan" (PDF). November 2016 – via Organisation for Economic Co-operation and Development. ^ a b Rogers, Simon (21 June 2012). "World carbon emissions: the league table of every country". the Guardian. Retrieved 18 October 2018. ^ a b "Kyrgyz Republic – Agricultural Sector | export.gov". www.export.gov. Retrieved 16 December 2018. ^ "Kyrgyzstan" (PDF). www.fao.org. 2012. Retrieved 16 December 2018. ^ "Kyrgyzstan's ancient walnut forest living through uncertain times | Eurasianet". eurasianet.org. Retrieved 17 December 2018. ^ "Financing Climate Action in Kyrgyzstan" (PDF). November 2016 – via Organisation for Economic Co-operation and Development. 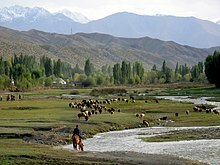 ^ "Kyrgyzstan: Floods and Mudflows – Apr 2012". ReliefWeb. Retrieved 16 December 2018. ^ a b c Hoelzle, Martin (2017). "Re-establishing glacier monitoring in Kyrgyzstan and Uzbekistan, Central Asia" (PDF). Geoscientific Instrumentation. 6 (2): 397. Bibcode:2017GI......6..397H. doi:10.5194/gi-6-397-2017. Retrieved 16 December 2018. ^ Liu, Qiao; Liu, Shiyin (2016). "Response of glacier mass balance to climate change in the Tianshan Mountains during the second half of the twentieth century". Climate Dynamics. 46 (1–2): 303–316. Bibcode:2016ClDy...46..303L. doi:10.1007/s00382-015-2585-2 – via Springer Link. ^ a b c d e "Financing Climate Action in Kyrgyzstan" (PDF). November 2016 – via Organisation for Economic Co-operation and Development. ^ "Kyrgyz Republic Economy: Population, GDP, Inflation, Business, Trade, FDI, Corruption". 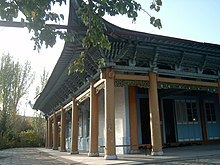 www.heritage.org. ^ "В 2017 году уровень бедности в Кыргызстане сократится до 31,7% – Всемирный банк". kabar.kg. 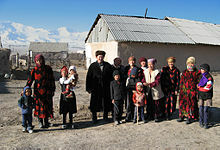 ^ "Kyrgyzstan: Returning Labor Migrants are a Cause for Concern". EurasiaNet.org. 2 April 2009. Archived from the original on 11 May 2011. Retrieved 16 June 2010. ^ "Ethnic composition of the population in Kyrgyzstan 2015" (PDF) (in Russian). National Statistical Committee of the Kyrgyz Republic. Retrieved 1 January 2015. ^ a b "Ethnic composition of the population in Kyrgyzstan 1999–2014" (PDF) (in Russian). National Statistical Committee of the Kyrgyz Republic. Archived from the original (PDF) on 6 July 2014. Retrieved 14 April 2014. ^ Kokaisl, Petr; Kokaislova, Pavla (2009). The Kyrgyz – Children of Manas. Кыргыздар – Манастын балдары. NOSTALGIE Praha. p. 132. ISBN 978-80-254-6365-9. ^ "Демоскоп Weekly – Приложение. Справочник статистических показателей". Archived from the original on 21 March 2016. Retrieved 14 February 2016. ^ "Демоскоп Weekly – Приложение. Справочник статистических показателей". Archived from the original on 16 March 2010. Retrieved 14 February 2016. ^ "5.01.00.03 Национальный состав населения" (PDF). Archived from the original (PDF) on 19 February 2012. Retrieved 25 March 2013. ^ "Перепись населения и жилищного фонда Кыргызской Республики (Population and Housing Census of the Kyrgyz Republic), 2009". NSC of Kyrgyzstan. Archived from the original on 21 January 2013. Retrieved 9 October 2012. 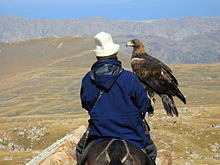 ^ "About Kyrgyzstan". S.Tentishev Memorial Asian Medical Institute. 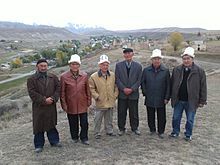 ^ "Kyrgyz Officials Reject Muslim Sect". RFE/RL. 6 January 2012. Archived from the original on 6 January 2012. Retrieved 6 June 2014. ^ a b "EurasiaNet Civil Society – Kyrgyzstan: Time to Ponder a Federal System – Ex-President's Daughter". Eurasianet.org. 17 July 2007. Archived from the original on 6 November 2010. Retrieved 2 May 2010. ^ "2015 Yearbook of Jehovah's Witnesses". Watchtower Bible & Tract Society. 21 December 2015. p. 182. ^ "Congregation Meetings of Jehovah's Witnesses". Watchtower Bible & Tract Society. 21 December 2015. ^ "Kirguistán la Iglesia renace con 600 católicos". ZENIT. 2 October 2008. Archived from the original on 7 October 2008. 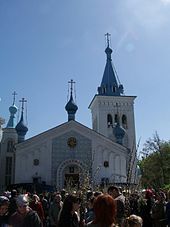 ^ "Jewish Bishkek: A Brief History and Guide". 3 February 2015. Archived from the original on 17 October 2017. Retrieved 17 October 2017. ^ "Human Rights Activists Condemn New Religion Law". Eurasianet.org. 16 January 2009. Archived from the original on 29 April 2009. Retrieved 2 May 2010. ^ "KYRGYZSTAN: "His screams of terror and pain could be heard throughout the building"". Forum 18 News Service. 21 December 2015. ^ "Kyrgyzstan: Court Confuses Jehovah's Witnesses for Islamic Radicals". eurasianet.org. 3 June 2011. ^ "Kyrgyzstan Court Upholds Acquittal of Two Women Convicted Under False Charges". Watch Tower Bible and Tract Society. 3 June 2011. ^ Aidar, Iliyas. "Kyrgyz Style – Production – Souvenirs". 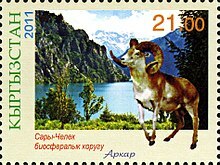 Kyrgyzstyle.kg. Archived from the original on 11 November 2006. Retrieved 2 May 2010. ^ Yurishcheva, A.A.; Kydralieva, K.A. ; Zaripova, A.A.; Dzhardimalieva, G.I. ; Pomogaylo, A.D.; Jorobekova, S.J. (2013). "Sorption of Pb2+ by magnetite coated with humic acids". J. Biol. Phys. Chem. 13 (2): 61–68. doi:10.4024/36FR12A.jbpc.13.02. ^ Curtis, Glenn E. (1997). "Kazakstan, Kyrgyzstan, Tajikistan, Turkmenistan, and Uzbekistan : country studies". Library of Congress. Library of Congress, Federal Research Division. Archived from the original on 16 March 2007. Retrieved 2 October 2018. ^ "University of Central Asia – University of Central Asia". Ucentralasia.org. 14 September 2018.